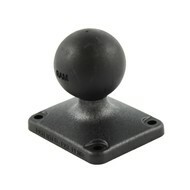 The RAP-202U-225 consists of a 1.5" diameter rubber ball connected at right angles to a 2" x 2.5" (51 x 63 mm) rectangular base. This mount has pre-drilled holes at each corner of the base plate. Goed ding. Zoals verwacht ! !